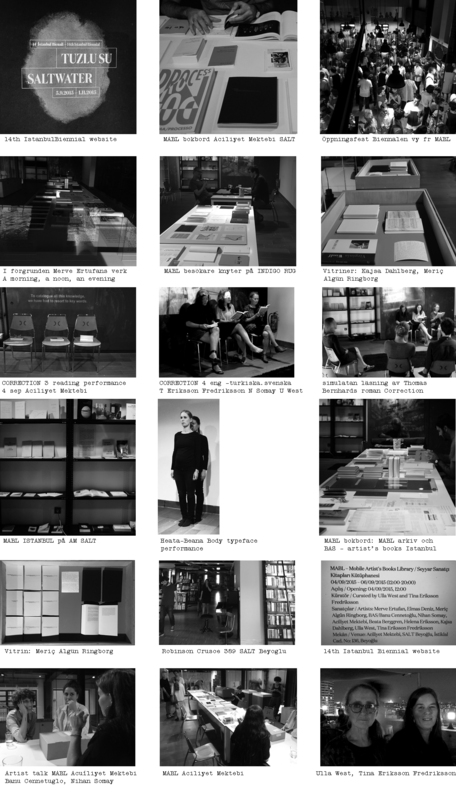 MABL – Mobile Art Books Library visits Istanbul to present artists and artist’s books from Sweden and Turkey. The aim is to exchange thoughts, ideas, artistic methods and works and not the least to initiate possible future collaborations with artists and organisations on location. As a follow up and continuation of the project and the exchange in Istanbul MABL is invited to Plattan Library at Kulturhuset in Stockholm later this fall 2015. MABL is run by Ulla West and Tina Eriksson Fredriksson. In conjunction with the opening of the 14th Istanbul Biennial MABL runs a three day programmed presentation at Açiliyet Mektebi/School of Urgency and the bookstore Robinson Crusoe 389 at SALT Beyoğlu. Also including an event at BAS in Karaköy. (For detailed information see schedule below). The program includes specially invited artists from Sweden and Turkey presenting works in the shape of books, sound, objects, performance, as well as talks and walks. Aciliyet Mektebi ” School of Urgency” is an autonomous pedagogic laboratory space located on the first floor at SALT Beyoğlu on İstiklal Caddesi. It started with an urgent need to rethink alternative models for the current education system in Turkey. It aims to engage the existing capacity of knowledge between professionals and academic users and turn itself into a collective learning center. An autonomous independently applicable pedagogical model. Operating based on models of alternative economy: No budget, No sponsors, No grant applications, but collaboration and exchange. Systematically growing community based on contribution. Established in 1994, Robinson Crusoe 389 is one of the best-known English language bookstores in Istanbul. It is located on the fourth floor of the art gallery SALT Beyoğlu on İstiklal Caddesi, and it has a wide selection of books from fiction to children’s books and art books. Anything not in store can be ordered, which the staff will be very happy to help with. As an independent bookstore, Robinson Crusoe 389 is a good choice for book hunting and interaction with locals. I return to this neighborhood in Jämtland close to the mountains, a place that is part of my family’s history. My father origins from this area but moved as a young man to were the jobs were offered, to the westcoast of Sweden. I have no roots from the place were I grew up by the westcoast. My family were strangers and when I before and now visit the north I am a stranger. I live since forty years in the capital, in Stockholm and in Stockholm I am one of many coming from out-of-town. I am a stranger. In this work I tie together my own experiences from time to time. Lived through time and experience is important in my work and in this project it will be my method to enable me along with others on site, by crafting and walking. Preference of interpretation: The place is the heart of narration. When I arrive to Hallen, I have a plan to make one or more long walk and to knot a rug, two activities to which all are invited to join. By these two activities I hope to understand this specific place better, especially my own history in relation to this place. At Allhuset, the meeting place in the village Hallen and at the same time the public library, I start the process of knotting a rug in wool yarns with a motif that is a map with marked hiking trails starting from Hallen. People who join in to the knotting mark out their homespot in the carpetmap. At Hallen Library I present a small collection from MABL and I begin to pick up stories from the library archive, from visitors, from what I catch up in and around Allhuset. I talk to people, I interview people. I present artist’s books from MABL. Parallel to this I read ”The Lure of the Local” by Lucy Lippard and the reading of Lippard is interwoven with Hallenmattan and the stories and the walks. I create my web of understanding that leads me hundreds of years back by another carpet, the Marbyrug that origins from Anatolien. ”The gap between image and lived experience is the space were dreams and ideas are created.” Lucy Lippard in ”The Lure of the Local”. The Marbyrug becomes the center of interest. Ideas, theories, patterns and lines around the rug are visualized.